About a year ago we started exploring what kind of solutions were possible and practical with FileMaker’s iOS SDK. We wanted to know how we could use it to deploy mobile apps for a few of our customers who were interested in leveraging Apple's Mobile Device Management (MDM) services to transparently distribute their custom apps. In order to truly test the ice, we established specific requirements. We needed to develop something that put a strain on all the components that would likely be required to support a typical customer solution. The system needed to be compact and self-contained. We didn't want to hook it up to some digital umbilical cord attached to external data, like many of our hosted solutions. It would also have to look like an app that was tailored to be in the mobile environment, not just pushed from the desktop cliff into the iOS abyss. The last requirement was a self-imposed one — it had to be a single purpose app that was dedicated to a linear workflow with very few options or different paths to follow. This last requirement actually reigned in the scope of the app so we could focus on its creation and not the underlining job it performed. After rooting around the app marketplace and doing some research on the web, we settled on a retirement calculator of sorts. 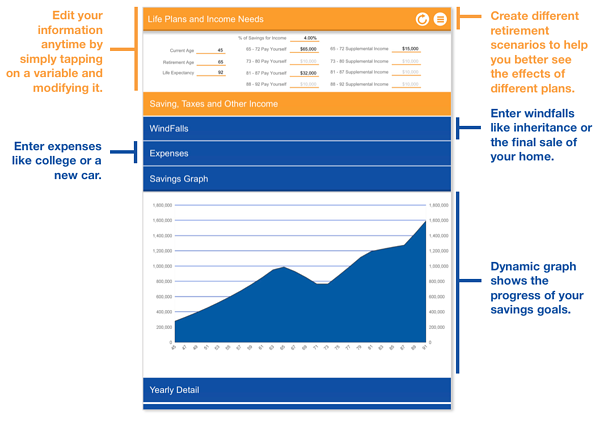 A financial app was appealing because there's no shortage of examples of data models and calculations. We knew we could just pick a few of these models and build the app around them without having to be too much of an expert on any particular one or even the field in general. The next challenge was getting the app part of the app right. Since we are a firm employing 15 or so certified FileMaker developers and the solution required a standalone iOS app, we naturally turned our attention to the FileMaker iOS SDK as a vehicle to make this dream a reality. We've created apps using FileMaker Go custom mobile app technology for our clients over the years and felt pretty confident we could use it to deploy this solution. But let me just say that FileMaker doesn't suggest or support that you use the iOS SDK to deploy an app on the App Store. They suggest you utilize Apple's MDM, but it is possible on the App Store as well. So we spent a considerable amount of time playing around with the interface and functionality trying to develop an app that would be both practical and compelling (at least to the graying Gen X'er who developed most of it). Using animated gifs, off layout tabs, web viewer based script triggers and oodles and oodles of global fields, we created what we hope is a useful and pleasant example of a FileMaker based iOS app. Admittedly our gift has more to do with money than good cheer - more Scrooge than Magi, if you will. Nevertheless, it should give you a few hours of financial fortune telling. It may not be very accurate fortune telling, but what fortune teller is? You're in for fun or horror depending on what it sees in its rather foggy crystal ball. This app is free and available only for iPad.